Our sports inflatable features a full size bounce area, obstacles inside, basketball hoop and a really fast slide that is perfect for any age group giving your party guests more to do. 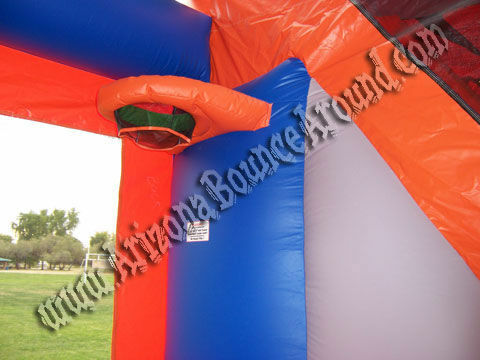 Rent this 5&1 Inflatable Sports Bounce House with 14’ slide for your next sports themed party. 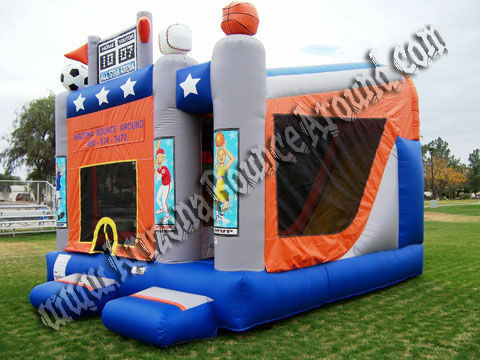 The Sports themed Inflatable features a full size bouncing area, Inflatable Obstacles, basketball hoop inside and a really steep fast slide that is perfect for any age group giving your party guests more to do. 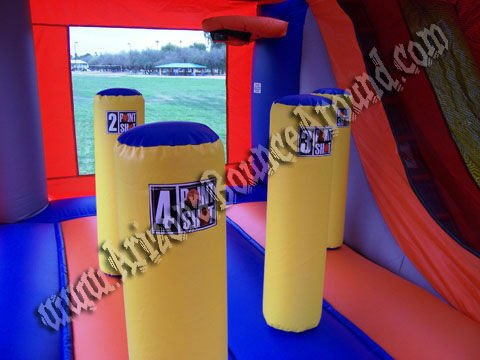 We also have a great selection of inflatable sports games. 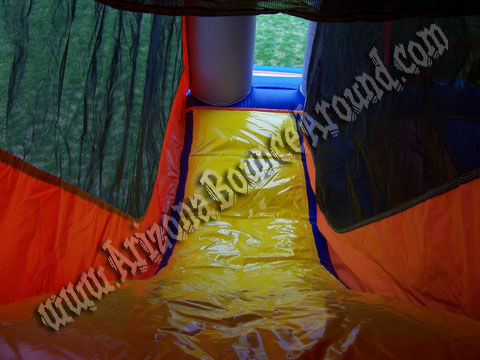 The slide features an easy to climb stair case and a zipper wall separating the bounce area from the slide that can be opened to let people easily go from the base of the slide back into the bounce area with or without exiting the inflatable. Perfect for bigger parties where after sliding down, the kids must exit the inflatable. It has 2 easy to climb front steps making entering and exiting very easy. Adults and kids of all ages can jump in the bouncy area and go flying down the attached slide. Our 5&1 Sports arena has beautiful art work featuring boys and girls, No climb netting and is brightly colored. Watch the kids bounce and slide at your next party by renting it today! More photos of this really cool Sports themed inflatable below, no clip art here! 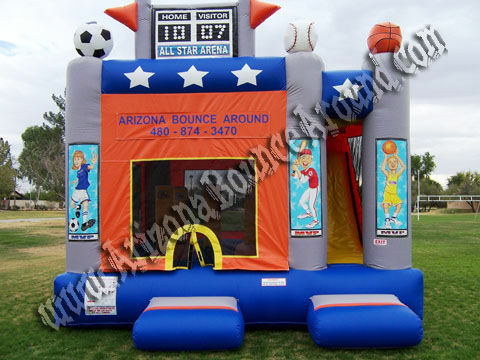 This sports arena bounce house rental price include standard set up. Standard setup is considered a real grass area or indoor area within 80 feet of sufficient electrical supply. Delivery and removal within included delivery area with no restrictions for delivery, set up or pickup. Parks require additional cost.